Services for Sen. Edward Kennedy will be Saturday morning at a Boston church before his burial in Arlington National Cemetery outside Washington, his office announced Wednesday. President Obama, who called Kennedy an “extraordinary leader,” will deliver a eulogy at the funeral, according to several sources. 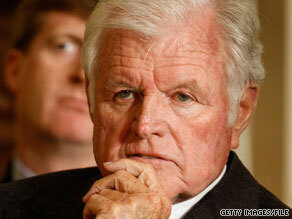 Kennedy died Tuesday night at his home in Hyannis Port, Massachusetts, after being ill for 15 months with brain cancer. He was 77. Obama, on vacation at Martha’s Vineyard, Massachusetts, said Wednesday that Americans knew Kennedy’s death was coming for some time, but have been “awaiting it with no small amount of dread.” “The outpouring of love, gratitude and fond memories to which we’ve all borne witness is a testament to the way this singular figure in American history touched so many lives,” Obama said. “His ideas and ideals are stamped on scores of laws and reflected in millions of lives — in seniors who know new dignity; in families that know new opportunity; in children who know education’s promise; and in all who can pursue their dream in an America that is more equal and more just, including myself.” The “extraordinary good that he did lives on,” Obama said. Before the funeral, Kennedy’s body will lie in repose Thursday afternoon and Friday in the Smith Center at the John F. Kennedy Presidential Library in Boston, said the source, who once worked closely with Kennedy’s office. A memorial service will be held Friday evening at the Smith Center, the source said. The funeral will be held at Our Lady of Perpetual Help Basilica in Boston’s Mission Hill section. The church is commonly known as the Mission Church. It is a short distance away from the Kennedy library. Watch bloggers talk about Kennedy’s life » The burial will take place at 5 p.m. at Arlington, the senator’s office said. Kennedy is eligible for burial at Arlington because of his congressional service and his tenure in the Army from 1951 to 1953. Army officials and members of Kennedy’s staff met at the cemetery a few weeks ago to discuss a plan for the burial, an official said. The plan was then given to the family by staff members. The proposed grave site is 95 feet south of the grave of Sen. Robert Kennedy, the official said. Robert Kennedy’s grave is, in turn, just steps away from the grave of their brother, President John F. Kennedy. The plot of land is currently covered with grass. At this point, U.S. military ceremonial units have not received orders for participating in a funeral, but military sources said a typical congressional funeral would include military personnel at the internment, a military team to carry the casket, a firing party for a gun salute and a bugler. Any arrangements will depend on the family’s wishes.